What would Jesus do if he were a student at Virginia’s evangelical Christian college, Liberty University? 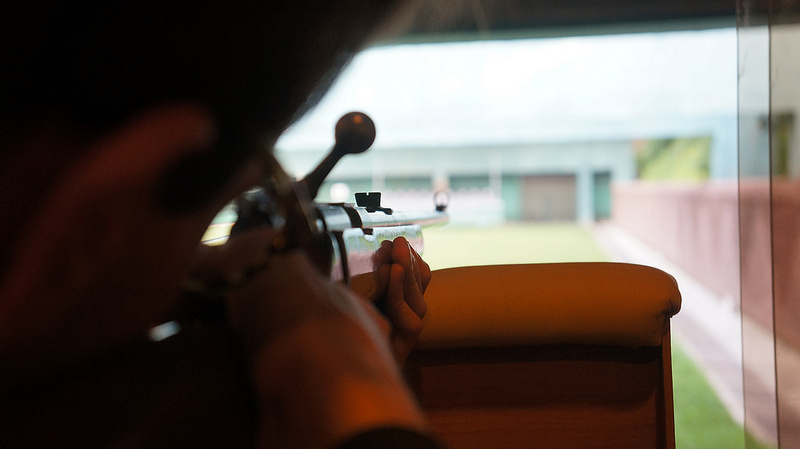 Is it possible he’d hang out at the on-campus shooting range the university plans to open in autumn 2017? On stage last year at a student convocation, in response to the mass shooting in San Bernardino, Falwell—packing a pistol in his back pocket—told students, “If more good people had concealed carry permits, then we could end those Muslims before they walked in,” and “Let’s teach them a lesson if they ever show up here.” Soon after, he announced plans to let students store their guns in their residence halls. Development of the shooting range comes after a meeting between Falwell and Wayne LaPierre, head of the National Rifle Association, and advice from the NRA on range safety. It will offer pistol, rifle, and shotgun facilities and be one of the largest on-campus firing ranges in the nation. The school offers a free course to students wishing to earn a concealed carry permit and has an active “Students at Liberty for Gun Rights” group. Thanks to over 65,000 online students supplementing the 14,000 on campus, Liberty is one of the largest universities in the United States and is a formidable force in Christian higher education. Its influence with evangelical voters is recognized and respected by politicians; both Sen. Ted Cruz and Sen. Bernie Sanders made on-campus appearances during the 2016 presidential campaign and President-elect Donald Trump recently met with Falwell to discuss a potential role in his administration. Despite being accused of trying to influence national debate on issues such as gun control, Falwell has denied any interest in politics, saying Liberty will effect world change through its graduates. With Jeff Sessions taking over as U.S. Attorney General and the job of criminal justice reform ever more clearly seated in the states, local advocates must build or maintain bipartisan momentum in state legislatures and municipalities with the support of philanthropy and national nonprofits.